Our UK graduate programme, based in Aberdeen, offers plenty of opportunities to develop your skills and expertise. You’ll be supported and encouraged by experienced trainers, supervisors and mentors who are there to ensure you achieve your full potential and progress your career with us. Join our UK engineering institute-accredited programme in a technical role and you’ll support North Sea projects, with the potential opportunity to experience working offshore. If you join us as a Finance or HR graduate in the UK, you’ll grow your experience across rotations in three of our key locations – Aberdeen, London and Sharjah, in the United Arab Emirates. 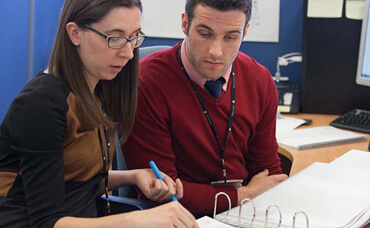 Whichever role you join us in, your development starts on day one with our graduate induction where we introduce you to Petrofac’s structure, values and business direction, and deepen your understanding of our industry. You’ll learn about what each part of the company does, and how it all fits together.